ADOLPH SUTRO (1830-1898). Mining engineer. Sutro formed the Sutro Tunnel Company which constructed a tunnel to provide ventilation, drainage and an easy means of transporting men and materials to and from the mines in the region of the Comstock Lode. Retiring to San Francisco in 1879, he became active in civic and business affairs, and was elected mayor in 1894. Always interested in the history and science of printing, he amassed a collection of over 200,000 volumes on this subject, much of which now forms a part of the San Francisco Public Library. Inscribed and Signed Book. 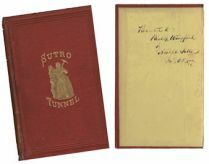 “Presented to Bishop Wingfield by Adolph Sutro, Oct. 6, 1877” Sutro Tunnel. Report of the Commissioners and Evidence Taken by the Committee on Mines and Mining of the House of Representatives of the United States, in Regard to the Sutro Tunnel, Together with the Arguments and Report of the Committee Recommending a Loan by the government in aid of the construction of said work. M'Gill & Withrow Printers and St, Washington, D.D. 1872. Gilt-stamped cloth. A portion of the front cover is separating from the binding. John Henry Ducachet Wingfield (1833 - 1898) Protestant Episcopal Bishop. Became the rector of Trinity church in San Francisco in 1874. During that year he was elected Missionary Bishop and first Dioceasan Bishop for Northern California. A superb association of Sutro and Northern California’s first Diocesan Bishop and one of the best known church leaders of the American West!